(Nanowerk News) Researchers at McGill University have developed a new, low-cost method to build DNA nanotubes block by block - a breakthrough that could help pave the way for scaffolds made from DNA strands to be used in applications such as optical and electronic devices or smart drug-delivery systems. 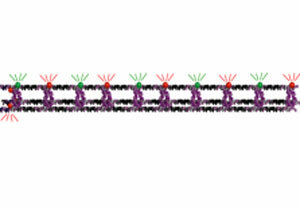 Many researchers, including the McGill team, have previously constructed nanotubes using a method that relies on spontaneous assembly of DNA in solution. The new technique, reported today in Nature Chemistry ("Stepwise growth of surface-grafted DNA nanotubes visualized at the single-molecule level"), promises to yield fewer structural flaws than the spontaneous-assembly method. The building-block approach also makes it possible to better control the size and patterns of the DNA structures, the scientists report. "Just like a Tetris game, where we manipulate the game pieces with the aim of creating a horizontal line of several blocks, we can now build long nanotubes block by block," said Amani Hariri, a PhD student in McGill's Department of Chemistry and lead author of the study. "By using a fluorescence microscope we can further visualize the formation of the tubes at each stage of assembly, as each block is tagged with a fluorescent compound that serves as a beacon. We can then count the number of blocks incorporated in each tube as it is constructed." Hariri's research is jointly supervised by chemistry professors Gonzalo Cosa and Hanadi Sleiman, who co-authored the new study. Cosa's research group specializes in single-molecule fluorescence techniques, while Sleiman's uses DNA chemistry to design new materials for drug delivery and diagnostic tools. The custom-built assembly technique developed through this collaboration "gives us the ability to monitor the nanotubes as we're building them, and see their structure, robustness and morphology," Cosa said. "We wanted to control the nanotubes' lengths and features one-by-one," said Sleiman, who holds the Canada Research Chair in DNA Nanoscience. The resulting "designer nanotubes," she adds, promise to be far cheaper to produce on a large scale than those created with so-called DNA origami, another innovative technique for using DNA as a nanoscale construction material.